• A legislator commented that they would "Never forget where I was when you told me to pray for my enemies." • In three Bible studies this week Pamela Russell had more than 50 ladies combined! • "Your Bagels and Books event every other week is the best Statehouse tradition ever!" 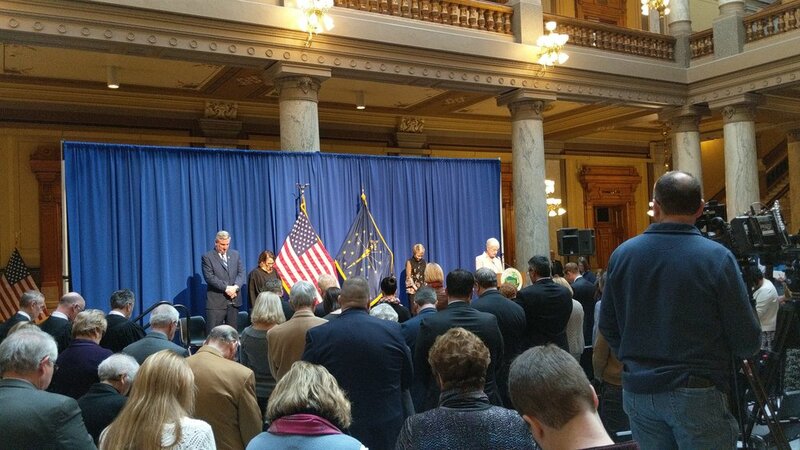 • (Pictured) Pam had the distinct honor to pray at the Inaugural Ceremony for three women who hold statewide office - Secretary, Treasurer, and Auditor of State! One of them even used the Bible we had given them. • 4 members of our ministry team opened the House and Senate sessions in prayer this week. • We received a gift from children who collected change all year to finish out our Bible fund need for this year - 1200 dollars! • The Legislators' Bible Study started back up in the Governor's office for the remainder of session. 25 legislators/leaders today! It's an honor to serve the Lord in this amazing arena with people that we love so much! Thank you for your prayer and support. We couldn't do what we do without you!